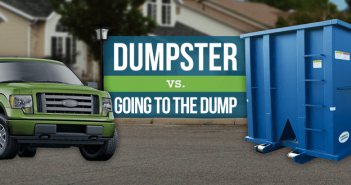 In Austin, Texas, dumpsters are being used for more than just getting rid of debris. For one man, a 33 square foot dumpster was turned into his home where he has been living for the last six months. His name is Dr. Jeff Wilson and he teaches at Huston-Tillotson University in Austin. Since embarking on his dumpster living journey, he has become known as Professor Dumpster. The project is set to last one year, and that means he has made it past the halfway point of his unique journey. Pulling off dumpster living really required a lot of planning, and he certainly couldn’t do it alone. Professor Dumpster has a whole team of students and staff behind him, including a student organization called “Green is the New Black”. Members of the team can even volunteer to spend a night in the dumpster to give the professor the day off. The team is crafting up energy efficient appliances for his simple living. They even added an air conditioner to help get him through the sweltering Texas summers. He painted the walls, installed sturdy floors, hung up some decorations, and made it into a homey place to live. It’s surprising how many people can actually fit into a 33 square foot dumpster comfortably. There is only one other known individual who has lived in a dumpster, Gregory Kloehn. Gregory helped the team with redecorating and making the dumpster a more comfortable place to live. He will be able to take his dumpster project to local elementary schools to share his project with the students as a teaching opportunity. It is a popular field trip location and intriguing for the students. They are given the opportunity to consider the workings of small space sustainable living, and are encouraged to contribute their own ideas to the project. The goal is to embrace efficient energy and prove it is possible to live on a much smaller scale… using only about 1% of what the average American uses on water, energy and waste. Americans are incredibly wasteful as we live in a disposable society. The project is taking reduce, reuse and recycle to the extremes. He even has a “plant” outside of the dumpster door, creatively crafted from other recycled dumpster pieces. He believes he will be happier by living a simpler life and a smaller, richer life. There are few worries and he is able to focus on himself and his happiness. There have been some challenges of course, like a leaky roof and extreme temperatures inside the small dumpster. On his website, there is a section that keeps track of the daily temperatures and conditions inside and outside of the dumpster. He also has to walk an hour down the hill to get water. But there have also been positives, such as a top-notch foundation prize (complete with a $75,000 check to go toward scholarships) and being able to live every day without being strapped to a monthly rent. 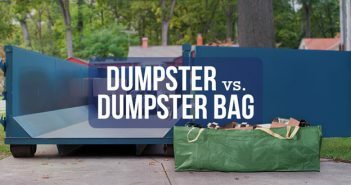 If you’re interested in keeping up-to-date with Professor Dumpster, you can check out his site and blog at www.dumpsterproject.org. 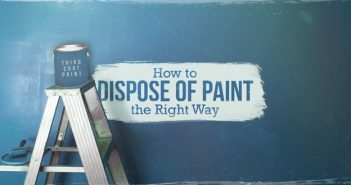 While Budget Dumpster doesn’t rent out dumpster homes, feel free to contact us if you’re interested in cleaning out your own home to make it a more comfortable place to live. Story from ABS News and The Dumpster Project.